Formula One boss Bernie Ecclestone has given organizers of Circuit of The Americas in Austin, Texas, one week to agree on a contract and produce a letter of credit guaranteeing payment of a $25-million sanctioning fee to stage the U.S. Grand Prix on Nov. 18, 2012. Without a guarantee or letter of credit, the event will be canceled, Ecclestone told Reuters on Thursday. Several European and Canadian sources reported that Ecclestone, president/CEO of Formula One Management and Formula One Administration, did not want the Texas contract situation to drag beyond the season-ending Brazilian Grand Prix in Sao Paulo on Nov. 27. The sanctioning Federation Internationale de l’Automobile (FIA) is scheduled to meet in New Delhi, India, to ratify the 2012 calendar on Dec. 7. But Ecclestone told Reuters he would not wait until that session of the World Motor Sport Council. 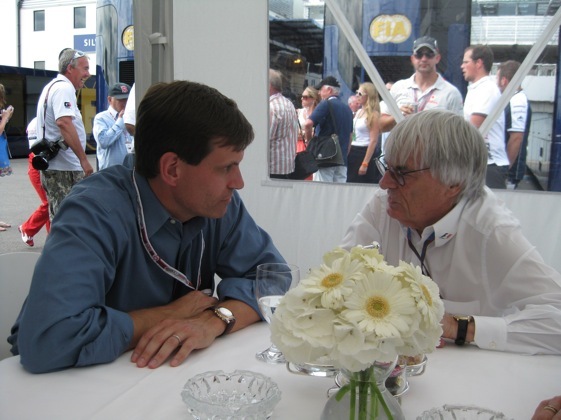 Ecclestone said Full Throttle Productions LP and Austin businessman Tavo Hellmund no longer owned rights to the race. Hellmund reportedly had signed a 10-year contract to host F1 on a $300-million facility under development in southeastern Travis County. “We’ve done everything we bloody well can to make this race happen,” Ecclestone told Britain’s Press Association, confirming his original contract with Hellmund recently had been canceled. Ecclestone said he then started negotiations with the track’s developers – Circuit of The Americas. “We had an agreement with Full Throttle Productions,” Ecclestone said in an article that originally appeared in Autosport.com. “Everything was signed-and-sealed, but we kept putting things off like the dates, various letters of credit and things that should have been sent, but nothing ever happened. Then these other people (COTA) came on the scene, saying that they wanted to do things, but that they had problems with Tavo. They said they had the circuit and that they wanted an agreement with me. “I told them they had to sort out the contract with Tavo, which they said they would. But that has gone away now because we’ve canceled Tavo’s contract as he was in breach. Organizers of Circuit of The Americas abruptly suspended construction Tuesday in the contract dispute involving Full Throttle Productions and circuit officials. Organizers stated in a news release that construction would remain suspended until a contract assuring the Formula One United States Grand Prix would be held at the facility in November 2012 is complete. The race contract had not been conveyed to COTA, as per a previously agreed upon timetable, according to the release. Meanwhile, Texas Comptroller Susan Combs told the Austin-American Statesman Thursday uncertainty surrounding the project would prevent the state from advancing the $25-million fee. Combs cited construction delays, infighting among the original partners and F1’s decision to stage a second race – the Grand Prix of America – in New Jersey beginning in 2013 as factors. The Austin F1 race is projected to generate an annual economic impact of approximately $300-million on the state and Travis County, according to the Office of the State Comptroller. Combs suggested the American-Statesman talk with lead investor Robert A. “Bobby” Epstein, a founding partner of Circuit of The Americas. COTA is owned and managed by Formula 1 United States. Original business partners include Full Throttle Productions LP, McCombs Partners and Prophet Capital Management. Entrepreneur Red McCombs is chairman of McCombs Enterprises and founding partner of COTA. Epstein is the founder and managing general partner of Prophet Management, a hedge fund and private investment company. Steve Sexton, former president of Churchill Downs Entertainment, is president of COTA. COTA officials declined a phone interview with RacinToday.com on Thursday, with an Austin-based public relations representative citing the “sensitive nature” of the dispute. Circuit of The Americas is under construction 20 miles southeast of downtown Austin in Travis County on a 970-acre site two miles from Austin Bergstrom International Airport. Its signature element will be a 3.4-mile, 20-turn road circuit with capacity for 120,000 fans. The track will feature elevation changes of up to 133 feet. COTA is billed as the first purpose-built Grand Prix facility in the United States designed for any and all classes of racing, from motor power to human power. The Indianapolis Motor Speedway played host to the most recent F1 race on American soil in 2007.